Naga has a skeletal body with a split nose. He is obsessed with gaining power over all. An outcast Bakugan who is both conniving and greedy, Naga tried to absorb the two energy cores Infinite and Silence, but only absorbed the Silent Core, and in the process exploded Vestroia. Naga nurses a grudge against Drago. 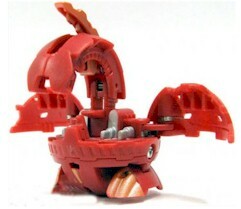 He is Hal-G's Bakugan. He is a skeletal, evil, split-nosed, dragon Bakugan who was an outcast due to the fact that he and his twin-sister Wavern were not aligned with any of the six regions of Vestroia. He has no attribute, but pop-up effects are similar to Darkus Bakugan. He altered Michael and Alice Gehabich and created Masquerade and Hal-G, and leads them in his quest to take both the Silent Core and the Infinity Core and gain the power to take the entire universe. Purchase Naga from Amazon now!